The Non-Motorized RGS04 Linear Rail is available with an input drive shaft that can be coupled to a motor or mechanical transmission. Rails can also be customized in stroke length, one or dual carriage and coatings. Contact an Applications Engineer for any technical support needed. 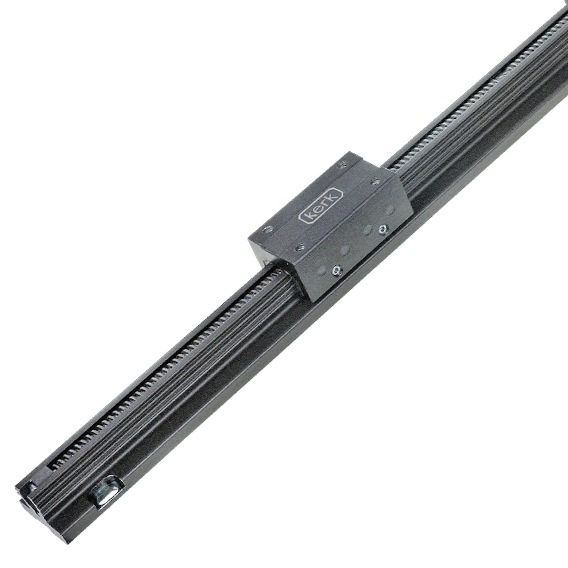 Kerk RGS Linear Guides provide a strong, stable platform for a variety of linear motion applications. The RGS Linear Guide is designed to easily mount to any flat surface, or bridge free spans, with a convenient, easy-access carriage. The splined aluminum profile, with Kerkote® TFE coating, combines low friction linear guidance with torsional stability. This proven combination of materials assures exceptionally long life without the need for adjustment, lubrication or maintenance. The simplicity of the RGS Linear Guide makes it both easy to use and a great value. The Kerk® RGS Linear Guides are perfect companions to the Kerk® RGS series of screw-driven linear slides.